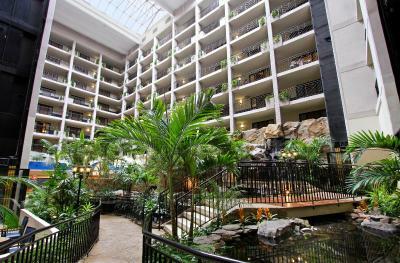 Lock in a great price for Embassy Suites Baltimore - North/Hunt Valley – rated 8.5 by recent guests! The clean room and courteous staff throughout the hotel. 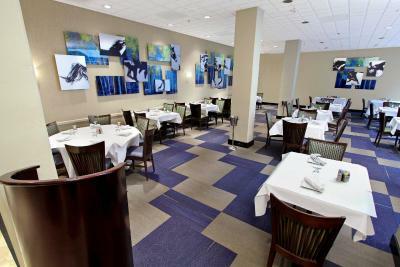 Super friendly staff and great seafood in the restaurant. 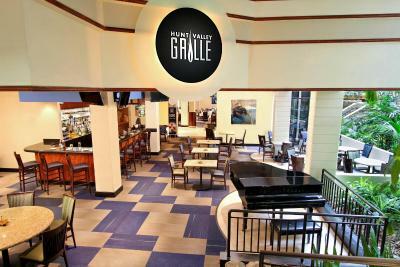 Great atmosphere and enjoyed the happy hour with a glass of wine and cheese and crackers. The central lobby area was just what we needed after a long day of driving. The tropical plants, the fish, the ponds, the layout, the waterfalls all were so inviting. We loved the room being lit when we entered—just reassuring that we were safe. Loved the free breakfast buffet—had a team to join us with lots of hungry fellows and yet we had plenty of food. 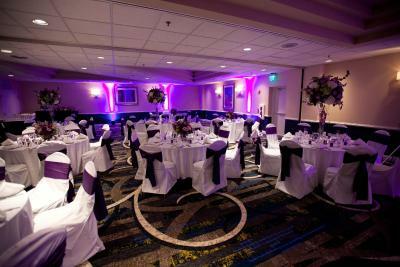 The hotel has plans for remodeling and we likely will be back to see the results. I literally went to this hotel solely for the breakfast and the cleanliness. We both loved it!! The social hour was nice! Wish they had more to choose from as far drinks. 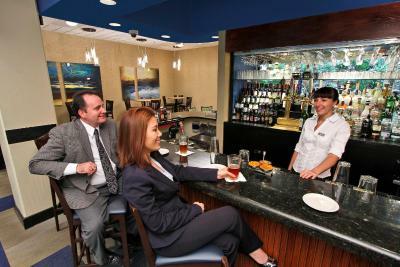 The staff is very nice and courteous. We will definitely be back. 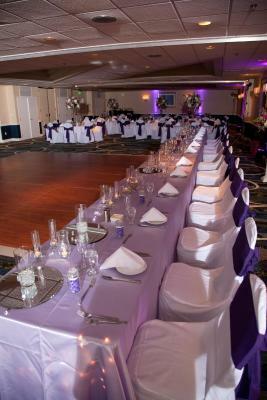 The room was very large. Bed was comfy! The breakfast was awesome. The staff was very friendly. 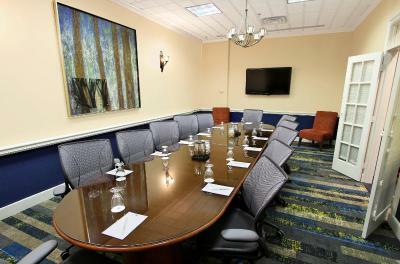 The rooms do need freshened/updated which they appear to be working on. I still was very happy with our stay and planned to stay again after renovations are complete. The made to order cook on Jan 31 morning was nothing short of TERRIFIC! Always kept his composure and was customer friendly the entire time. The hotel was clean. The staff was friendly and my stay was awesome. Our grandchildren enjoyed their freedom to explore the "forest", feeding the fish, the pool, the reception, the big breakfast and the room. I can't say enough how accommodating they were for all in our party: fish food, extra blankets, tooth brushes, pillows and allowing children to be children. 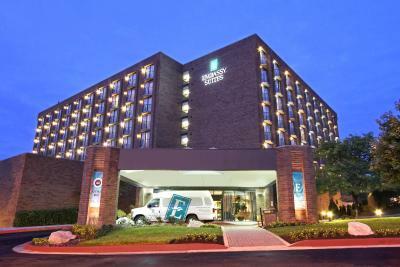 Embassy Suites Baltimore - North/Hunt Valley This rating is a reflection of how the property compares to the industry standard when it comes to price, facilities and services available. It's based on a self-evaluation by the property. Use this rating to help choose your stay! 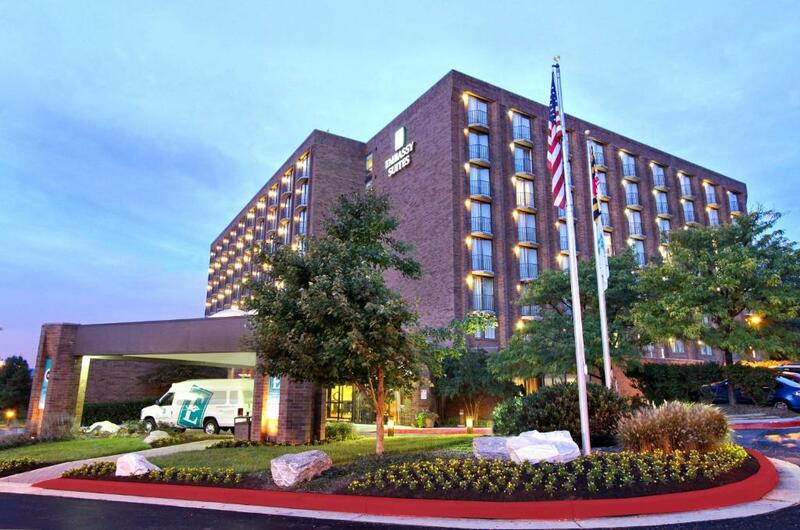 Only a short drive from Baltimore city centre, this all-suite hotel offers easy access to area attractions. 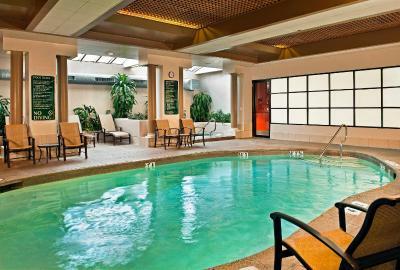 It features an indoor pool and spacious accommodations with 32-inch flat-screen TVs. 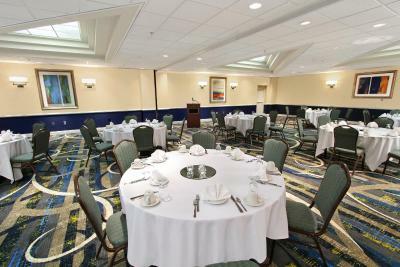 The Embassy Suites Baltimore-North/Hunt Valley offers guests a cooked-to-order breakfast as well as a free evening reception. There is also an on-site convenience store. Each suite is equipped with a microwave, refrigerator and coffee maker. They provide a separate living room with a sofa bed and an alarm clock radio with an MP3 connection. 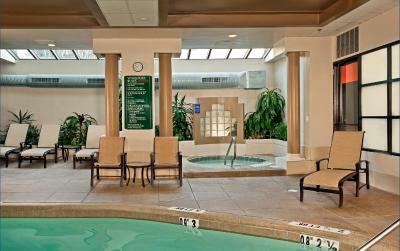 Guests at the hotel can work out in the state-of-the-art gym or relax in the jacuzzi. 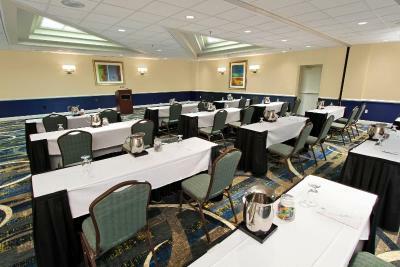 Hunt Valley Embassy Suites is located close to the Pimlico Race Course as well as the Hunt Valley Towne Center shopping centre. The sites of Baltimore city centre, including the Inner Harbor, are easily accessible with the nearby light-rail public transport station. 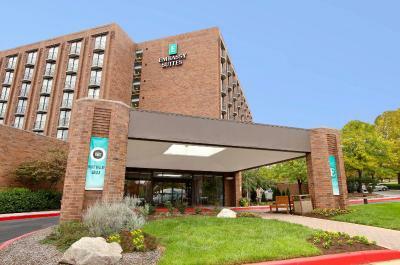 When would you like to stay at Embassy Suites Baltimore - North/Hunt Valley? Suite includes a private balcony, a mini-fridge and a microwave. A living room with cable TV and a sofa bed is also provided. WiFi is available in all areas and costs USD 14.99 per 24 hours. 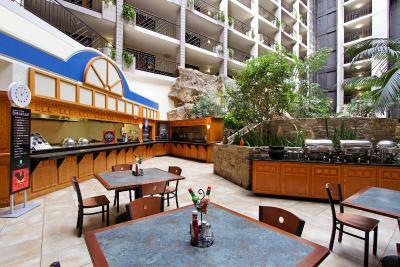 House Rules Embassy Suites Baltimore - North/Hunt Valley takes special requests – add in the next step! 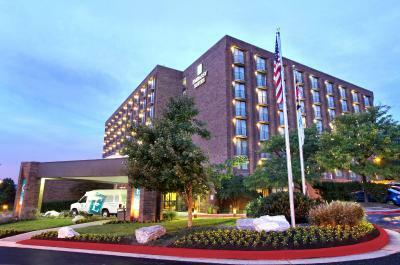 Embassy Suites Baltimore - North&#47;Hunt Valley accepts these cards and reserves the right to temporarily hold an amount prior to arrival. Embassy Suites Baltimore - North/Hunt Valley accepts these cards and reserves the right to temporarily hold an amount prior to arrival. Room interior ior a.bit dated and worn but signs all over assuring us they are in the midst of remodeling. Breakfast buffet items were stale and old. That I couldn’t stay longer! We definitely plan to make a trip back! Elevate not working on check out. Had to walk down 7 flights of stairs. I honestly like everything. We had such a great time. The only complaint I have is just the freshening/updating of the carpet, bedding and decor. Even with that it was still a good room and great stay. The music in the lobby plays all night and can be heard if sleeping on the pull out sofa in the front room of each suite. I was told the music coukd not be turned down/off. The pull out sofa bed was incredibly uncomfortable. I'm not sure how anyone could sleep on it. Every bar/spring could be felt. Ultimately, I closed the sofa bed and slept on top of the couch cusions. The Heat was also an issue, room was so hot and the only way to,cool it off was to open the balcony door. Not acceptable. 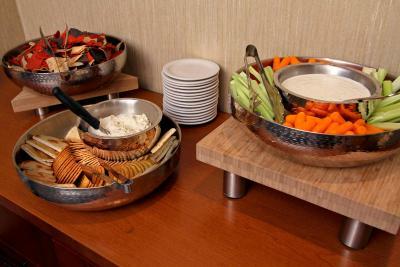 Plentiful buffet with something for everyone.